Xocoline has been developed from a blend of fine cocoa beans selected from different plantations and chosen specifically for the complementarities in their flavors. Slightly acidulous, the fruity notes blend into the roasted flavors, allowing the development of a delicate bitterness with woody undertones. This assembly guarantees the no sugar added couverture remains both inimitable and consistent in taste. We've asked some chocolatiers to taste test for us, and they told us Xocoline is the best no sugar added chocolate they ever tasted! Choose Xocoline Milk Chocolate or Dark Chocolate couverture for your favorite recipe. Sweetened with Malitol. 3 Kg/6.6 lb. 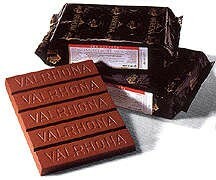 Bloc of Xocoline Milk 41% Chocolate (No Sugar Added), original Valrhona package.